Tips on Feeding Your Horse During the Winter Cont. 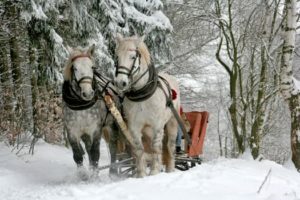 In our last blog, we discussed ways to maintain your horse’s nutritional needs during the winter. For more tips, please read on! Store hay: hay is a great way to keep your horse warm because when it digests, it creates heat in your horse’s digestive tract. To save money and to make sure you have enough to last the winter, you should consider buying your hay as early as possible. If you have an older horse: an older horse will usually have weaker teeth and as a result, it can be difficult for them to process hay. To help your horse properly digest his hay, you can soak alfalfa cubes or pellets of hay to soften the texture. Keep a supply of salt: salt is extremely important for your horse’s nutritional needs and so you want to make sure you provide a trace mineral salt block. Condition score regularly: putting a rug on your horse will definitely help keep him warm and cozy but it is important to remove the rug regularly. You will want to condition score which means you will assess the amount of body fat on your horse’s neck, wither, ribs, and loin. This is an important process because it helps you identify if your horse is losing, gaining, or maintain the proper weight. For tips and information on horses, please refer to our blog often! If you are interested in purchasing one of our high quality horse insurance plans, give us a call today at either 320.243.7250 or 800.328.8894!